2. vs. Tricky, deceiving, unstable (said to be named for the octopus’ ability to change its color, and its waving of a tentacle to and fro like the motion of a seaweed in water). The first meaning of limu, above, covers a vast array of what we would term seaweed as well as algae. In my circle of friends we have even extended it to mean any armpit hair or even wild, untamed hair. I even hear the younger generation using the term limu for something that is stale or old (as in, that song is limu already). 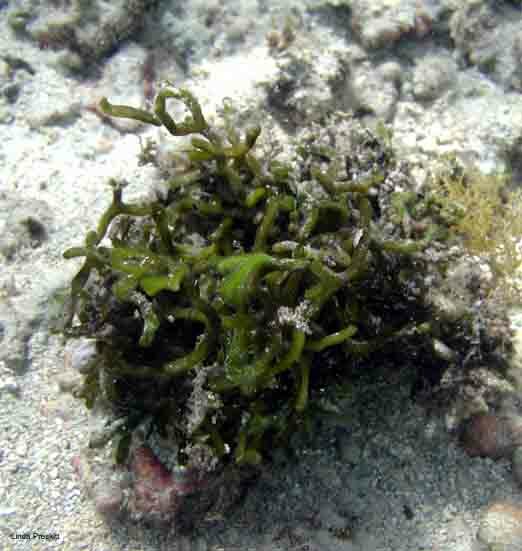 In Hawaiian the word limu, to most Hawaiians, refers to seaweed in the ocean, with the prefix lī- being used with the proper names of some types of limu, like līpeʻepeʻe (for limu peʻepeʻe) or līpaʻakai for limu that has been salted for indefinite storage. Much of the limu growing in or on our islands do not have Hawaiian names, or their Hawaiian names are not known, probably implying that they were not used or that their names have been lost with the passage of time. Hawaiians still gather limu in traditional ways and prepare the limu in much the same way as in days gone by. What is poke ʻahi without limu? Who doesn’t crave limu kohu with its distinct flavor? Who loves limu ʻeleʻele from Molokaʻi? Those cravings are the body’s need for the minerals that other foods here could not provide. In a traditional Hawaiian diet, limu was the third component of a balanced diet, consisting primarily of poi and fish. Limu is also used for religious, medicinal and spiritual purposes. The limu kala is used in hoʻoponopono because the word kala means forgiveness or to forgive. It is also used in purification rituals, along with ʻōlena, or turmeric. And did you know the kala fish feeds on the limu kala? Its name is a coincidence. Līpeʻepeʻe was forbidden to those training in hula because a the word peʻepeʻe means “to hide” and it is believed that the knowledge in hula would be hidden to those who eat it. I am sure many of you have your favorite limu and I hope you can still find it in your secret spots you learned when you went picking with your kupuna. Many of those spots are long gone or limu isn’t growing there due to overpicking or more likely, pollution. So sad. I remember small kid days swimming in ʻEwa Beach, limu manauea (also known as ogo) all over the place, people could pick bread bags full. You didn’t even need to step foot in the ocean, it was all washed up on the sand. And then sitting and cleaning all the limu in the pākini once you got home. Those were the days. Reduplication of hānupa, surging, swollen; choppy, as the sea; slippery, muddy. When I was growing up there was a catchy tune with the phrase, “E hele au ma ke kai, ma ke kai hānupanupa,” which means, I will go to the sea, the choppy sea. Then the movie, Lilo and Stitch came out and its Hawaiian Rollercoaster Ride song came out with a line that goes, “ʻo ka moana hānupanupa” and follows a line about hurrying up, getting your surfboard and riding the waves. How fun! Nā ʻale hānupanupa o Paiololo – The choppy billows of Pailolo (Pailolo is the channel between Oʻahu and Molokaʻi). The Pueo, or Asio Flames Sandwichensis, is endemic to the Hawaiian Islands. What is the difference between endemic and indigenous, you ask? Okay maybe you didn’t ask but here goes anyways. Endemic means it is native (came here by natural means) and is specific to ONE location, either an entire island OR a small section of land (think of the silversword of Haleakalā). Pueo can be found on Kauaʻi, Maui, Oʻahu and Hawaiʻi. No where else. In the world. An adult pueo is brown and white, eyes are yellow and the bill is black. It has feathered feet and legs. When you call a barn owl a pueo, it isn’t really one. Maybe call it a pueo malihini, a newcomer owl. Unlike the common barn owl (the owl we most often see here in Hawaiʻi at night), the pueo is diurnal. That is, it hunts during the day (most active at dawn and dusk). They can be seen most often hunting in grasslands, searching for rodents, insects, and sometimes, though rarely, birds. I love watching them flying right above the grass in Waimea and Waikiʻi. So beautiful. Because their nest is built on the ground they are highly susceptible to being disturbed by feral cats and mongoose, probably a major cause for the decline in population. The pueo is worshipped, like the ʻio (Hawaiian hawk), as anʻaumakua by some ʻohana. They are considered protectors, especially in battle. In one well known legend, Kahalaopuna, a young woman, is killed by her husband, only to be revived by the family ʻaumakua, a pueo. In Kamakau’s writing in Kūʻokoʻa (June 1, 1867), he relates a true story of a woman, Kahulunuikaʻaumoku, killed in battle, who is saved by a pueo who guides her to safety and finds a kahu, or caretaker, to feed her and care for her injuries. Thus is the power of the mighty pueo, mystic bird of the past, majestic bird of the present. Malu ke kula, ʻaʻohe keʻu pueo – The plain is quiet, not even the hoot of a pueo is heard (all is at peace). While we don’t have eagles of any sort in our islands, I am always amazed if and when I see one in North America. Ua lankila nā ʻAeko – The Eagles won. E lele me he ʻaeko lā – Fly like an eagle. 2. n. Any circular motif, as in tapa. Kōnane pūpū, checkerboard pattern [with rounded pits on each square, as on tapa]. 5. nvt. To draw or gather together; to draw tight, as a fishing net. Cf. pūpū lauoho, pūpū weuweu. Pūpū wahi kūʻōʻō ka mahi ʻai o uka; ola nō ia kini he mahi ʻai na ka ʻōiwi, the upland farmer gathers the small injured sweet potatoes; the multitudes find life, when the farmer farms for himself [though the potatoes may be small, the independent farmer supplies his kin]. Today’s He Momi reflects our cherished pūpū or shells, a number of which are found in our ocean waters or in our mountains! Yes. mountains. Our most highly prized pūpū are the Niʻihau shells, known as pūpū o Niʻihau, shells of Niʻihau (although you can find them on Kauaʻi shores). Each pūpū o Niʻihau has a distinct name: pūpū laiki (rice shell, named because its shape and color resembles a grain of rice) and pūpū Kahelelani, named for a chief famous on that island. There is the pūpū kani oe and the kāhuli or the land and tress snails, many species which are extinct or endangered. These pūpū (there were/are some 800 species), like many other endemic plants and animals here, carefully evolved over time as a unique and precious native of specific landscapes and locations. One unique feature to the tree snail, unlike most mollusks which produce eggs, is that it is born alive, complete with its own shell. Top speed of a tree snail is about three inches a minute. Back to the ocean and one of my favorite pūpū, the leho or leholeho, the cowry shell. This pūpū was prized by the heʻe (octopus) and thus, the heʻe fisherman. Hawaiians would make a lure, using the pūpū leho, a favorite food of the heʻe, with a hook and line. Of course, this Super Bowl Sunday, you are probably more concerned with #3 above. Pūpū are also appetizers. One big mistake everyone makes is putting an s on the end of the word: pupus. Big no no. You don’t need to AND you shouldn’t. Do not pluralize any Hawaiian word with an s. Trust me. When using the word pūpū people will know whether it is plural or singular just by the context. ʻO kēia ka lā mua o ka mahina ʻōlelo Hawaiʻi, ʻo ia hoʻi, ʻo Pepeluali! Today is the first day of Hawaiian language month, that is, February! And in my effort to be WAY better at sharing my aloha for my ʻōlelo makuahine (mother tongue, which for me is really my father tongue, so to speak), I am just going to share short and sweet daily words and hope that I can keep up during the weekdays at least. Stop here. Say a little prayer for me in hopes that I can do it. Okay, proceeding. I am going to let go of all of my hangups with trying to be PERFECT in every aspect (except spelling and translation, that has to be as perfect as I can possibly be which means that you may find a needle in a haystack and may disagree with my spelling or my translation but then you’d be wrestling with me, Mary Kalena Pukui, and many others). If you don’t like my grammar (especially my run on sentences or incomplete sentences, punctuation where it does or doesn’t belong), my inconsistency with bolding or italicizing, well, love me anyway. I mean well. Okay, so with all of your prayers and hopefulness, see you tomorrow!